The Ghanaian painter Owusu-Ankomah, who has been living in Germany for 30 years, today ranks among the most prominent representatives of contemporary African art. His solid career as an artist is marked by significant exhibitions around the world. There is not an important presentation of works on modern Africa to which the artist is not invited. Over the years, the artist has increasingly devoted his works to spiritual and metaphysical themes. Spirituality is increasingly becoming a source of inspiration for his art. 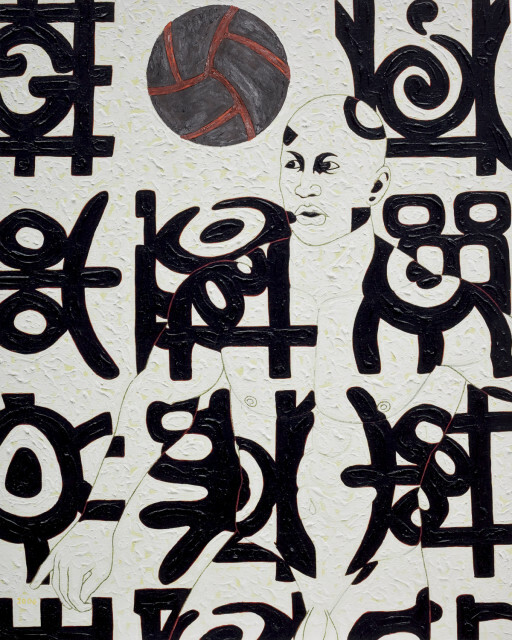 It was in particular the large-format, condensed canvases of the MOVEMENT and MICROCRON series, often reduced to a black-and-white colour scheme that constituted an important turning point in the artistic career of Owusu-Ankomah, gaining the artist high recognition and appreciation on the international art markets. His few still available works from this series are sought-after collector’s items, commanding lofty prices at international auctions.